Please read this page with hope and aspiration in your heart. 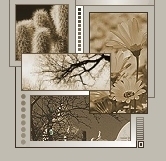 Visit the links and explore each carefully. related to severe injury caused by watercraft. Manatee deaths caused by boats are generally the result of one of two things - the manatee is crushed against the bottom of the waterway by watercraft or "sucked into" the very large propeller of a tug boat or ship. When crushing occurs, the internal injuries seen are "bilateral" meaning they are present on both sides of the manatee, (left and right ribs are broken with equal pressure). Large propellers cause very large cuts, sometimes completely severing the body in one or more places. Smaller boats, on the other hand, usually cause "unilateral" injuries upon impact (rib fractures and other internal injuries are found on only one side of the body). Also, the props of smaller boats obviously leave relatively less severe cuts, although they certainly can be lethal. The vast majority of injuries seen in manatees by researchers who determine the cause of death are the type that occur when the manatee encounters a boat in the "recreational" size class. And, contrary to some stated beliefs, both inboard and outboard motors can kill or injure a manatee. Currently, more manatees are killed by impact with the hull of the boat than by the propeller, and most manatees in the wild bear scars from collisions with boat. Yet remember that all types of boats that are going too fast are dangerous to manatees. Since manatees can only travel about 3-5 mph hour (they can go up to 20 mph in short bursts), any boat that is traveling faster than 15-20 mph is capable of injuring or killing a manatee. SLOW DOWN IN SHALLOW WATER! 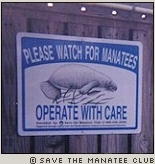 These signs are being erected around the Florida waterways by members of Save The Manatee Club™. The effort is being made to make boaters aware to slow down in the shallow water inhabited by the plant eating manatees. Save The Manatee Club™ was established in 1981 by former Florida Governor Bob Graham and by singer/songwriter Jimmy Buffet. Please take the time to visit this very important web site devoted to the preservation, education, and conservation of the manatee and the waterways they inhabit. Feeding the manatees can be lethal! The practice of feeding and attracting manatees to an area is discouraged for a variety of reasons and is illegal under state and federal law. First, manatees fed food items meant for human consumption may suffer health problems as a result. Manatees may also grow accustomed to receiving food from man, thereby losing their natural fear, and may begin approaching vessels and docks looking for handouts. Manatees lured to unsafe areas, such as marinas, increase their chances of being struck by vessels in these dangerous areas. When necessary, manatees can travel long distances to find natural food sources and do not need man to supplement their diets. Calves must learn from their mothers how to forage. Manatees are an endangered species. 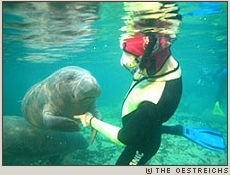 Although this picture looks wonderfully exciting, be advised: It is illegal to improperly interact with manatees. This includes the IMPROPER touching of manatees, riding them, poking them, feeding manatees or giving them water, any actions that might separate a mother and calf, chasing manatees or surrounding them. All of the forms of interactions (improper touching of manatees, riding them, poking them, feeding manatees or giving them water, any actions that might separate a mother and calf, chasing manatees or surrounding them) may be considered harassment under the Endangered Species Act (ESA). Manatees are an endangered species, protected under the federal Endangered Species and Marine Mammal Protection Acts and the Florida Manatee Sanctuary Act. Conviction on the federal level is punishable by a fine of up to $100,000 and/or one year in prison. Swimming with the gentle giants. 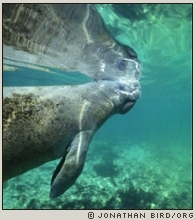 If you are interested in swimming with the manatees, PLEASE use a professional snorkeling tour. They will train you how to approach the manatee, what is "safe touching"... and give you the opportunity to learn more about this wonderfully precious mammal that NEEDS to be and MUST be protected. Professional tours can educate people to the plight of the manatee, their habitat, and methods we must take to preserve both. Do NOT snorkel into a manatee habitat without first learning about the proper techniques for being near these gentle giants. 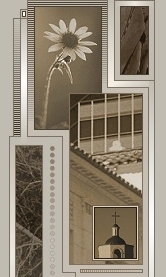 Click photo for tour information. Birds Underwater Manatee Tours provide snorkelers with a RESPONSIBLE visual and physical connection to the manatee while maintaining the safety of both the manatee and their habitat. Manatees are gentle, giant creatures and are at the mercy of the human population. Please do not discard your fishing hooks, monofilament fishing line, trash, and soft drink plastic rings (that holds the cans together) into the water. Manatees ingest this waste and it can be lethal. Boat responsibly. The waterways are the liquid bounty of Mother Earth . . . and all Her magnificent creatures. A sincere note of appreciation to Ms. Nancy Sadusky of the Save The Manatee Club™ for her guidance and educational efforts about the Florida manatees. "Save the Manatee" and "Adopt-A-Manatee" are registered trademarks of Save the Manatee Club, Inc., a nonprofit 501(c)(3) organization, registered in the state of Florida. All rights reserved. Opening photograph used on this page is Copyrighted © Mr. Jonathan Bird of Oceanic Research Group, and used ONLY with his prior written permission. First and second swimmer photograph used on this page is Copyrighted © Bill & Diana Oestreich of Birds Underwater Tours and used ONLY with their prior permission.